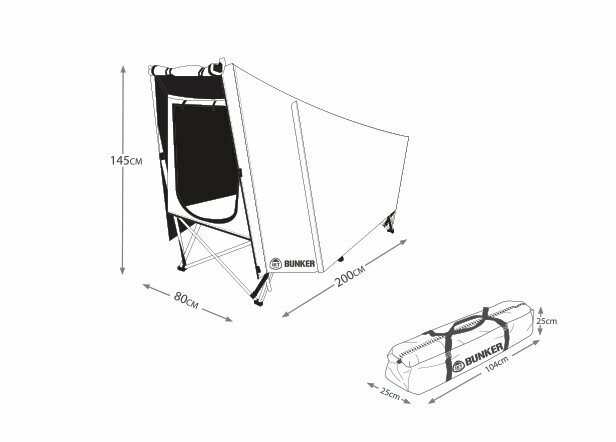 Enjoy the sleeping comfort of a cot with the protection of a tent with the Jet Tent Bunker Tent Cot from OzTent. 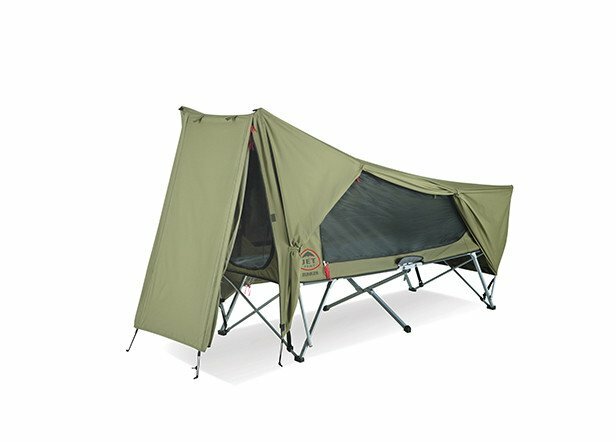 This single person tent cot combines the easy-to-carry protection of a single man tent with the comfort of a steel frame cot to keep you off the cold ground in winter and provide all around ventilation in hot weather. 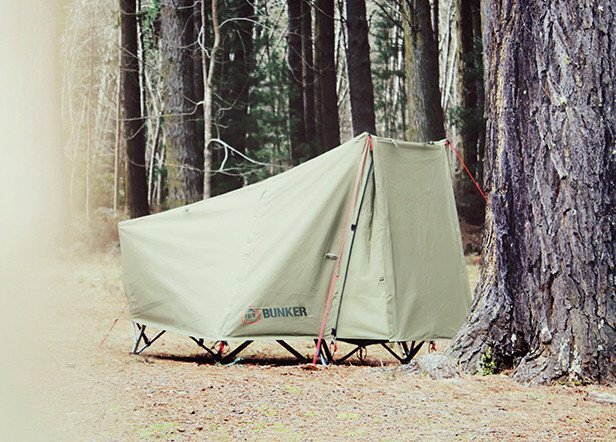 Built on a heavy-duty steel frame with a cross leg stretcher design, the Jet Tent Bunker provides a comfortable night's rest for campers up to 150kg. 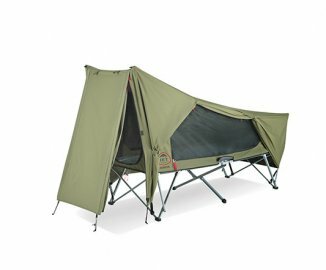 With walls made of a water resistant 1000mm coated cotton and a waterproof ripstop poly-cotton canvas fly, this tent cot stands up to harsh camping weather when needed. The 600D x 600D PVC coated polyester bed comes fully padded for a more restful night of sleep. The Jet Tent Bunker also features large No-see-um mesh window panels for welcome ventilation. Comes with waterproof carry bag. Be quick, this one wont last long..! The FF1 is designed with quality and ease of use in mind, with a touch of luxury thrown in. 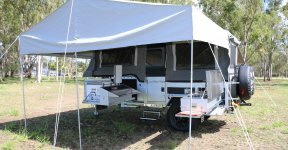 Using our extensive knowledge gained during our 20 years of manufacture in Australia, we have designed what is, undoubtedly the class leader in Forward Folding Campers. 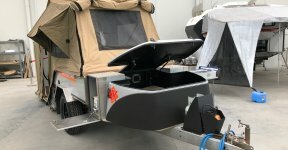 From our Modcon designed Suspension to the patented Modcon twin seal in the lid our Campers are built to withstand our harsh Australian conditions. The FF1 is one of the easiest campers on the market to setup. With a market leading twin strut design, the lid is perfectly balanced and a breeze to open, even for the single traveller. With only one internal bow to push out, you are set up and ready to go in no time. For short stays we provide a Touring Awning which is quick and easy to set up, with just three poles needed. If you intend on a longer stay, why not put up the Full Awning, and move the Touring Awning to the other side of the camper. And if the weather becomes inclement our campers come with a full annex as well. Sleeping 4 in comfort, there is a Queen size innerspring mattress at the front of the camper and a settee that converts into a Double bed by night. We also offer an extra cushion that will allow you to convert the Settee into a Queen size bed! The New ModCon Quattro S4 has arrived and is on display! ModCon Campers would like to present the latest in the Quattro Series. We have listened to your feedback and have developed a quick open and closing camper that sleeps four adults comfortably. With your standard Queen size Innerspring Mattress and two single beds for sleeping that converts to a day time settee for lounging on those wet days. The additions and attributes are similar to our popular FF1 Camper Trailer. 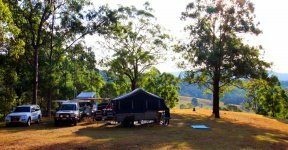 We have included a huge amount of pantry space and storage areas (2000L total) to suit every style of camping, from the adventure to Cape York or the two weeks away on the beach. This camper is capable of travelling all over Australia. Copyrights. All rights reserved - Victorian Camper Trailers.